I follow the Baltic Dry Index of global freight rates because it is a reliable leading economic indicator (forecasting the future). Shippers are unlikely to book cargo space if they have nothing to ship and the index cannot be manipulated by Central Banks like the Fed or derivative-creating banksters. I wrote the following two months ago when the index slipped below 1,000; that, “…the over-supply of ships is now 5 year-old news so the shipping industry has had enough time to clear the surplus. In other words, we can no longer blame “too many ships” for low shipping rates. This is falling demand. “What we’re seeing is a collapse in commodity demand (and prices) and a massive slowdown in China along with the rest of the world which never really recovered from the Great Recession.” Good grief, now I’m quoting myself! Less than two weeks ago I wrote in Circling Closer to the Drain 2015 that the index had fallen to 709 which was equal to the levels last seen in 1986. So much for the so-called global economic recovery. Recessions typically occur every four to six years. It’s now more than seven years since the last ‘Great Recession” began in December 2007 so we’re overdue for another big one. 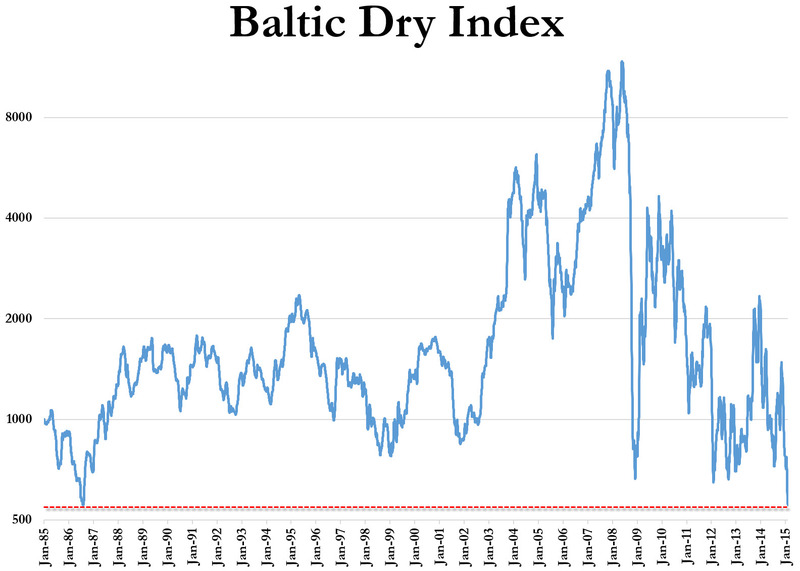 The Baltic Dry Index’s new all-time low tells us the next recession will be far worse than the last one. My gut-feeling is this time there will be No Recovery, Ever. Are you prepared? If not, you’re running out of time. Fast. This entry was posted in Collapse 2015, Economic Collapse and tagged Baltic Dry Index, commodities, economic slowdown, global economic recovery, leading economic indicator, next recession. Bookmark the permalink. Great observation, Paul! Difficult to assign the war drums to stupidity or incompetence. Wars are always a good way to distract the masses from real issues. And, it’s surprising how many people (so-called leaders included) believe “war is good for the economy” despite Bastiat proving this to be a ‘broken window’ fallacy. And then the other saying, “Give a man a fish, teach a man a fish,” liberals never heard of either apparently. As a species, I don’t think the dinosaurs were ever stupid enough to commit suicide the way we have. We created a complex system that exists really only in our minds. Animals don’t understand it, yet we live and die for it. Even Martin Armstorng (Thanks for tellign em about him) believes we need a good reset, although this entails that the process will simply repeat itself. Good points. Paul. And you’re right; we never learn. In fact, the only thing we learn from history is we don’t learn from history. http://princetoneconomicsintl.com/store-products-services/market-reports/cycles-of-war-2014/ involving invasions and internal revolutions. The bad news is the cycles keep repeating. On the other hand, the good news is we know they keep repeating so we can prepare for the inevitable. Armstrong forecasts a major sovereign debt crisis 2015.75 i.e. this fall. Jim Sinclair forecasts a Great Levelling in 2016 and a Great Reset about 2020. This means we’ll have about four years of turmoil before they introduce a new fiat currency except this one won’t last but a decade or two. BTW – I like the other fish story. Give a man a fish and you feed him for a day. Teach a man to fish and he’ll sit in his boat drinking beer all day.